The NPDUIS Advisory Committee for their expert oversight and guidance in the preparation of this report. The PMPRB would also like to thank the Canadian Institute for Health Information (CIHI) for their assistance in generating the raw dataset used in the analysis, and the Canadian Agency for Drugs and Technologies in Health (CADTH) for validating the data associated with their organization. The CompassRx annual report monitors and analyzes the cost pressures driving change in prescription drug expenditures in many Canadian public drug plans. After several years of low to moderate growth, these expenditures increased sharply by 9.9% in 2015/16, with varying rates of growth in its two main components: drug costs (12.0%) and dispensing costs (3.8%). This report provides insight into the factors driving these increases, as well as a retrospective review of recent cost trends. To put the results into perspective, the analysis also identifies notable policy developments at the federal and provincial levels related to drug approval, price review and reimbursement. The findings from this report inform policy discussions and aid decision-makers in anticipating and responding to evolving cost pressures. Methods: An established cost-driver model was used to isolate the key factors contributing to the changes in the drug costs and dispensing costs. The analysis focuses on the following Canadian public drug plans participating in the National Prescription Drug Utilization Information System (NPDUIS) initiative: British Columbia, Alberta, Saskatchewan, Manitoba, Ontario, New Brunswick, Nova Scotia, Prince Edward Island, Newfoundland and Labrador, and Health Canada’s Non-Insured Health Benefits drug plan. Data source: The main data source for this report is the NPDUIS Database at the Canadian Institute for Health Information (CIHI). Prescription drug expenditures in the NPDUIS public drug plans reached $11.3 billion in 2015/16, an increase of $1 billion over the previous fiscal year, reflecting a notable 9.9% rate of change after years of low growth. Drug costs were the largest component, accounting for nearly three quarters (74.7%) of the total expenditures, followed by the dispensing costs (21.8%) and reported markups (3.5%). On average, the NPDUIS public drug plans paid 79.7% of the total prescription costs for 285 million prescriptions dispensed to over 9 million active beneficiaries. The average annual prescription cost for the non-senior population (60%) continued to rise in 2015/16, at a steeper rate than previous years. The costs for seniors (40%) also increased, a shift from the declining cost trend in previous years. Drug costs increased by 12.0%, or $0.9 billion, reaching $8.4 billion in the NPDUIS public plans in 2015/16, driven primarily by the increased use of higher-cost patented drugs. The notable increase in drug costs followed a number of years of negative or low rates of change from 2012/13 to 2014/15. The shifting trend is the result of reduced savings from generic pricing and substitution, as well as the increased cost pressure from higher-cost drugs. Patented drugs, the largest market segment, grew at a rate of 18.8% in 2015/16, while drugs exceeding $10,000 in annual treatment costs grew by 60.5%. These high-cost drugs were used by less than 1% of public drug plan beneficiaries and accounted for 27.6% of the total drug costs. Some cost drivers, such as the demographic and volume effects, have a fairly stable and predictable annual impact on costs, together contributing approximately 4% to the cost growth in any given year. The impact of the increased use of higher-cost drugs (or the drug-mix effect) generally has the most pronounced push effect on drug cost in public plans, in the range of 4% to 5%, as observed over the 2012/13 to 2014/15 period. In 2015/16, the drug-mix effect had a sharp 12.1% upward push on drug costs due to the use of innovative direct-acting antiviral (DAA) drugs for hepatitis C (8.0%) as well other higher-cost drugs (4.1%). The counterbalancing pull of generic substitutions and price effects decreased to -4.1% in 2015/16, following a trend of steady decline since 2012/13 (-9.2%) that paralleled the reduction in the impact of generic price reforms and the patent cliff. 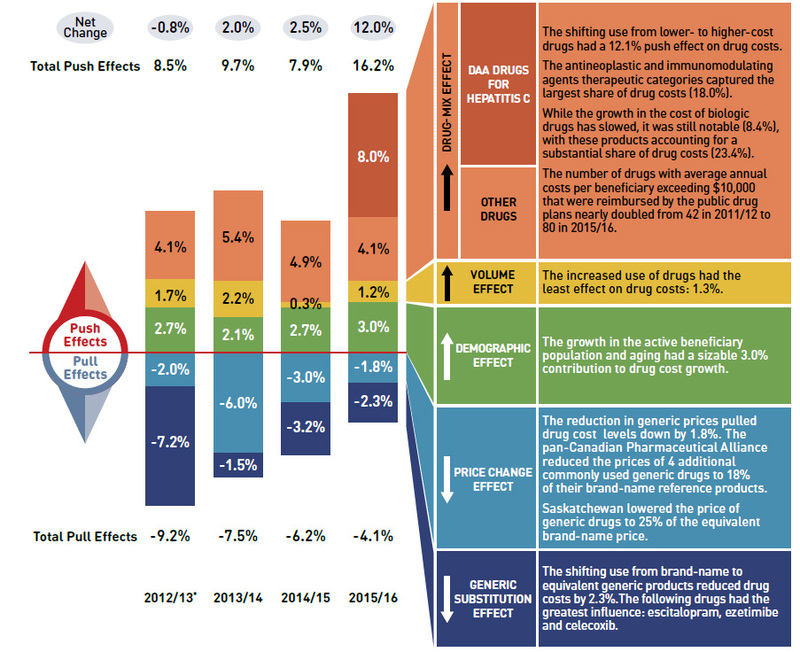 This bar graph and adjacent tables describe the factors or effects that impacted the rates of change in drug costs in the NPDUIS public drug plans for each year from 2012/13 to 2015/16. Each bar is broken out into the following factors - demographic, volume, drug mix, price change and generic substitution - and a percent change is assigned to each. The bars are totals for all NPDUIS drug plans combined, and the effects for Hepatitis C drugs are isolated because of their high impact. Three one-line tables above and below the bar graph show the total positive or push effects and net change, (above) and negative or pull effects, (below) for each year. A color-coded table to the right of the bar graph provides written analysis for each effect. * Results for 2012/13 do not capture the data for the British Columbia and Newfoundland and Labrador provincial public drug plans. Dispensing costs in the NPDUIS public plans increased at a slower rate in 2015/16 compared to previous years, reaching $2.5 billion. The growth in dispensing costs of 3.8% (or $90.7 million) in 2015/16 represented a decrease from the rates reported in previous years (e.g., 7.3% in 2014/15). Changes in the average dispensing fee per prescription, which had sizable push effect on dispensing costs in previous years, had virtually no impact in 2015/16 (-0.2%). The prescription size effect made only a modest contribution to the growth in dispensing costs in 2015/16 following the introduction of provincial policies related to the number or size of prescriptions. 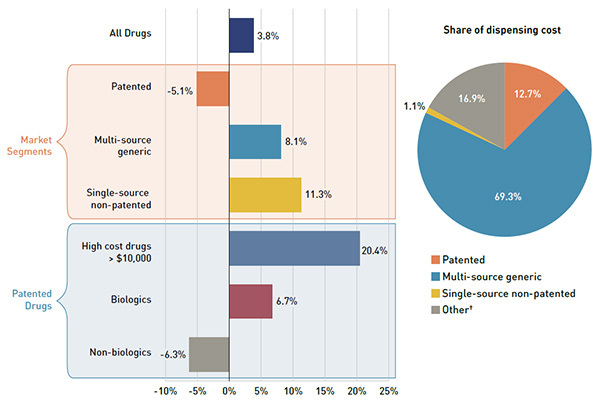 Dispensing costs for patented drugs declined by 5.1%. This change was more than offset by the increase in the dispensing costs for generic drugs, reflecting the generic substitution trend observed in recent years as the patent protection ended for many important drugs. Canadian public drug plan expenditures represent a significant portion of the overall health-care budget. Of the $29.4 billion that Canadians paid for prescription drugs in 2014, the largest component (42.6%) was financed by the public drug plans, with the remainder paid by private plans (35.2%) or out-of-pocket by households and individuals (22.2%)Footnote 1. After several years of low to moderate growth, prescription drug expenditures in Canadian public drug plans rose dramatically by 9.9% in 2015/16. Building on the results of the previous two reports, this edition of the CompassRx explores the cost pressures that contributed to this significant growth. The increase in prescription drug expenditures is the net result of shifting cost pressures related to the price, drug-mix, demographic, and volume effects. In 2015/16, the use of more expensive drugs continued to push public drug plan costs upward, while the downward pull of generic substitution and price reductions lessened. 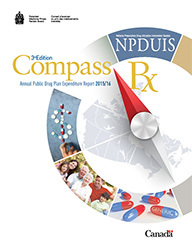 This report uses a cost-driver analysis to examine and precisely quantify the impact of various effects on the NPDUIS public drug plan expenditures. The analysis focuses on the public drug plans participating in the National Prescription Drug Utilization Information System (NPDUIS) initiative, which includes all of the provincial public plans (with the exception of Quebec), as well as Health Canada’s Non-Insured Health Benefits drug plan. These plans account for approximately one third of the total annual spending on prescription drugs in Canada. The report is divided into four main sections. The first two sections provide the context for the cost-driver analysis, including an overview of federal drug approvals and price reviews in 2015/16; a summary of plan policy developments; and an examination of recent trends in expenditure and utilization levels in the public drug plans. The next two sections explore the cost drivers of the two main components of drug expenditure: drug costs and dispensing costs. Several appendices to the report, along with supplementary reference documentsFootnote I, provide detailed supporting information. The results of this analysis aid stakeholders in anticipating and responding to the evolving cost pressures affecting Canada’s public drug plans. The main data source for this report is the National Prescription Drug Utilization Information System (NPDUIS) Database, developed by the Canadian Institute for Health Information (CIHI). This database houses pan-Canadian information on public drug programs, including anonymous claims-level data collected from the plans participating in the NPDUIS initiative. Information on public drug plan initiatives and policy updates was obtained from publicly available sources, including CIHI’s NPDUIS Plan Information DocumentFootnote 2 and IMS Brogan’s Provincial Reimbursement AdvisorFootnote 3. Results are presented for the following NPDUIS public drug plans: British Columbia, Alberta, Saskatchewan, Manitoba, Ontario, New Brunswick, Nova Scotia, Prince Edward Island, Newfoundland and Labrador, and Health Canada’s Non-Insured Health Benefits (NIHB) drug plan. The totals reported include data from all of the NPDUIS public plans included in the analysis. The study analyzes rates of change in prescription drug expenditures from 2014/15 to 2015/16, as well as recent trends in expenditures and utilization focusing primarily on data from 2011/12 to 2015/16. The drug costs reported in this study are the amounts accepted toward reimbursement by the NPDUIS public plans. For more detail, see the Glossary in the Reference Documents section of the NPDUIS Analytical Studies page on the PMPRB website. The results reported for Saskatchewan and Manitoba include the accepted prescription drug expenditures for individuals who are eligible for coverage but have not submitted an application and, therefore, do not have a defined deductible. For the NIHB, claims that were coordinated with provincial public drug plans are excluded from the analysis to ensure consistency in the annual data reporting. The results reported for New Brunswick include the number of active beneficiaries enrolled in the Medavie Blue Cross Seniors’ Prescription Drug Program and their related drug expenditures, which are offset by monthly premiums. The analysis of the drivers of drug and dispensing costs follows the methodological approach detailed in the PMPRB report The Drivers of Prescription Drug Expenditures: A Methodological ReportFootnote 4. Analyses of the average prescription size, as well as pricing, are limited to oral solids to avoid data reporting inconsistencies that may exist in the day supply and unit reporting of other formulations. Expenditure and utilization levels vary widely among the jurisdictions and cross comparisons of the results are limited by the designs and policies of the individual public drug plans, as well as the demographic and disease profiles of the beneficiary populations. For example, public drug plans in British Columbia, Saskatchewan and Manitoba provide universal income-based coverage, while other provincial public drug plans offer specific programs for seniors, income assistance recipients and other select patient groups, and the NIHB provides universal care to its entire population. The NPDUIS Database includes sub-plan data specific to particular jurisdictions. This further limits the comparability of results across plans. For instance, Alberta, Nova Scotia and Prince Edward Island submit the data for a select subset of their sub-plans to NPDUIS. A comprehensive summary of the sub-plans available in the database, along with the eligibility criteria, is available in the Reference Documents section of the NPDUIS Analytical Studies page on the PMPRB website. The totals for the NPDUIS public drug plans are heavily skewed toward Ontario due to its size. This edition of the CompassRx reports on data up to and including the 2015/16 fiscal year. Developments that have taken place in the Canadian environment since then are not captured in the analysis. Drug costs reported are the amounts accepted toward reimbursement by the public plans and do not reflect off-invoice price rebates or price reductions resulting from confidential product listing agreements. The prescription drug expenditure data for the public drug plans reported in this study represents only one segment of the Canadian pharmaceutical market, and hence, the findings should not be extrapolated to the overall marketplace. In Canada, public drug plans reimburse eligible beneficiaries in accordance with their specific plan designs, and implement policies related to the reimbursement of drug prices and dispensing fees. Health Canada, the Patented Medicine Prices Review Board (PMPRB), and the Canadian Agency for Drugs and Technologies in Health (CADTH) are responsible for drug approvals, price reviews, and health technology assessments, respectively. This section provides an overview of the provincial and federal developments in 2015/16. Generic drugs: The pCPA implemented the final steps of an initiative aimed at reducing the prices of commonly used generic drugs to 18% of their brand-name reference products. On April 1, 2015, 4 drugsFootnote II were added to the list, increasing the total number of drugs to 14. The final step in the initiative was completed on April 1, 2016, with the price reduction of another 4 drugsFootnote III for a final total of 18. In addition, a one-year bridging period was put into effect on April 1, 2017, in which the prices of 6Footnote IV of the 18 molecules were further reduced from 18% to 15% of the brand reference price. Brand-name drugs: As of January 31, 2017, 133 joint negotiations or product listing agreements (PLAs) for brand-name drugs were completed by the pCPA, with negotiations underway for another 38 drugsFootnote V.
Biosimilar drugs: With the emergence of biosimilars, the pCPA is working toward establishing a policy framework related to these products. On April 1, 2016, the pCPA released a set of First Principles to guide negotiations and inform expectationsFootnote VI. In addition to the pCPA initiatives, on April 1, 2015, Saskatchewan lowered the price of generic drugs to 25% of the equivalent brand-name price. An overview of the drug pricing initiatives implemented since the initiation of generic pricing policies in 2010 is available on the Reference Documents section of the NPDUIS Analytical Studies page on the PMPRB website. Alberta froze dispensing fees at $12.30 through to April 1, 2017. 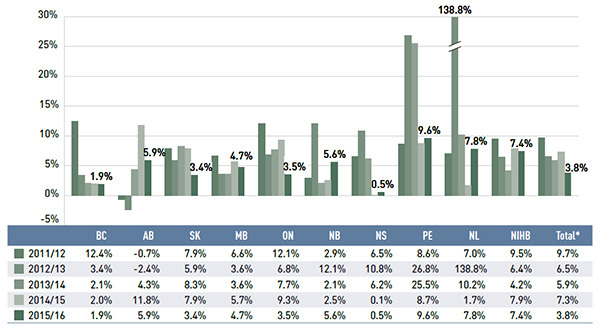 Prince Edward Island increased the home capitation fee for private nursing from $73.55 to $75.02. Ontario decreased dispensing fees for residents of long-term care facilities by $1.26 and encouraged pharmacists to dispense 100-day supplies of chronic-use medication. In October 2015, Prince Edward Island introduced a new Generic Drug Program for residents under the age of 65 without private insurance, limiting the out-of-pocket costs for eligible generic prescription drugs to a maximum of $19.95. In Ontario, changes were made to encourage the use of lower-cost generics. Effective October 2015, patients were required to try two or more generics—and document adverse reactions—prior to having a brand-name product paid for by the public plan. Health Canada grants the authority to market a drug in Canada once it has met the regulatory requirements for safety, efficacy and quality, and issues a Notice of Compliance (NOC). Figure 1.1 reports the number of unique new active substances (NASs) approved each calendar year from 2011 to 2015Footnote 5. In 2015, Health Canada issued NOCs for 37 NASs: 5 biologics and 32 prescription pharmaceuticals. Comparably, 40 NASs were approved in 2013, while fewer new substances were approved in the other years: 26 in 2011; 23 in 2012; and 25 in 2014. The bar graph shows the number of new active substances approved by Health Canada from 2011 to 2015, broken out by prescription pharmaceutical and biologic. Data source: Notice of Compliance Database, Health Canada. The PMPRB reviews the factory-gate prices of patented drugs sold in Canada and ensures that they are not excessive. As part of the price review process, the PMPRB’s Human Drug Advisory Panel (HDAP) reviews and evaluates each new drug and assigns a recommended level of therapeutic improvement. Figure 1.2 depicts the breakdown of the 151 NASs approved by Heath Canada between 2011 and 2015 by level of therapeutic improvement. As part of the price review process, the PMPRB completed scientific reviews of 117 of these substances and determined that 62.4% demonstrated slight or no improvement over existing therapies, while 23.9% were classified in the moderate improvement category. Over the five-year period, only 16 of the 117 NASs reviewed by the PMPRB were classified in the substantial improvement or breakthrough categories. Five of these drugs had a sizable impact on public drug plan expenditures in 2015/16, including the hepatitis C drug Sovaldi (sofosbuvir); the pulmonary fibrosis drug Esbriet (pirfenidone); the cystic fibrosis drug Kalydeco (ivacaftor); and two oral cancer drugs: Imbruvica (ibrutinib) used in the treatment of lymphoma, and Pomalyst (pomalidomide) for multiple myeloma. These five drugs were all classified in the substantial improvement category. The PMPRB also reports on pharmaceutical trends for all medicines and research and development spending by patentees. The PMPRB is consulting with Canadians on the need for reform its Compendium of Policies, Guidelines and Procedures. In June 2016, the first phase of this process was launched with the release of a Discussion Paper that provides a framework for the consultationsFootnote 6. The PMPRB compares the prices of Canadian patented drug products to the median prices of its seven comparator countries (PMPRB7): France, Germany, Italy, Sweden, Switzerland, the United Kingdom and the United States. In 2015, Canadian prices were decidedly higher than prices in the United Kingdom, France, Italy and Sweden, on par with Switzerland, and lower than Germany. Drug prices in the United States were 2.7 times higher than in CanadaFootnote 7. The bar graph shows the total number of new active substances (NASs) reviewed by the Patented Medicine Prices Review Board (PMPRB) from 2011 to 2015, broken out by level of therapeutic improvement: breakthrough, substantial, moderate or slight/no improvement and other. Note: Drugs reviewed by the PMPRB prior to the implementation of the 2010 Guidelines have been merged as follows: category 2 drugs are included in the breakthrough category; category 1 drugs are included in the slight/no improvement category; and category 3 drugs are included in the moderate improvement category. *The year of reporting reflects the year in which the Notice of Compliance was issued (Figure 1.1) rather than the year that the PMPRB conducted its price review. †New active substances not reported to the PMPRB as of the 2015 Annual Report. Data sources: Notice of Compliance Database, Health Canada; Patented Medicine Prices Review Board (PMPRB). CADTH’s Common Drug Review (CDR) provides reimbursement recommendations and advice to Canada’s publicly funded drug plans (except for Quebec) based on an evaluation of the clinical, economic and patient evidence of drugs marketed in Canada. The provinces take these recommendations under advisement when making formulary listing decisions and in price negotiations. Figure 1.3 summarizes the CDR recommendations for fiscal years 2012/13 to 2015/16Footnote 8. The total number of CDR recommendations increased from 33 in 2012/13 to 50 in 2015/16. While in 2012/13 there was an almost equal number of list with criteria/condition and do not list recommendations, by 2015/16 this proportion had changed, with 41 of the recommendations being list with criteria/condition and 7 being do not list. As of April 1, 2016, CADTH no longer accepts confidential drug prices, as the submitted prices are disclosed in the recommendations and reports. The bar graph shows the total number of Common Drug Review listing recommendations from 2012/13 to 2015/16, broken out recommendation: list, list with criteria/condition, do not list at submitted price, do no list and list in a similar manner to other drugs. Note: Drugs may have multiple recommendations, depending on the various indications for which they are being reviewed. For this analysis, the categories list with criteria/condition and list with clinical criteria and/or conditions were combined. Data source: CADTH Common Drug Review Reports. After several years of low to moderate growth in prescription drug expenditures, the annual rate of change for the NPDUIS public plans grew sharply (9.9%) in 2015/16—totaling $11.3 billion for the reimbursement of 285.1 million prescriptions dispensed to over 9 million active beneficiaries. This growth was primarily driven by a dramatic 12.0% increase in drug costs, with dispensing costs having a more moderate increase of 3.8%, and the reported markups increasing by 7.1%. While the emergence of new hepatitis C treatments made an appreciable contribution to the growth in drug costs, other high-cost drugs also exerted an important upward pressure: drugs exceeding $10,000 in annual treatment costs increased by 60.5% in 2015/16. The expenditures reported in this section represent the total amount accepted for reimbursement by the NPDUIS public drug plans and include the following three components: drug costs, dispensing costs, and markups. These amounts reflect both the plan-paid and beneficiary-paid portions of the prescription costs, such as co-payments and deductibles. The considerable variations in expenditure and utilization levels across the NPDUIS public plans are due to differences in the plan designs and policies, as well as the demographic and disease profiles of the beneficiary populations. These factors limit the comparability of results across plans. Reference documents providing supplementary information on individual public drug plan designs, policies governing markups and dispensing fees, and a glossary of terms are available on the NPDUIS Analytical Studies page on the PMPRB website. A number of factors drive the year-over-year change in prescription drug expenditures, such as the use of higher-cost drugs, increases in the volume of drugs used, changes in prescription size and dispensing fees, the increased use of generic drugs and the implementation of generic pricing policies, among others. The impact of various effects on drug costs and dispensing costs are discussed in detail in sections 3 and 4, with a focus on the rates of change from 2014/15 to 2015/16. In 2015/16, the NPDUIS public drug plans had a total prescription drug expenditure of $11.3 billion. As in previous years, drug costs accounted for approximately three quarters of the total amount (74.7%), with dispensing costs (21.8%) and markups (3.5%) making up the rest (see Figure 2.1). Public plans paid for 79.7% of the total expenditures, while the rest was paid by the beneficiaries either out-of-pocket or through a third-party private insurer. This bar graph shows the total prescription drug expenditure in 2015/16 for NPDUIS public drug plans, broken out by percent shares of the components: drug cost, dispensing costs and markup. A table below provides totals in millions of dollars for the components and the plan paid amount. The last line in the table is the plan paid share of total prescription cost as a percent. Note: A wholesale upcharge amount may be captured in either the drug cost or the markup component, depending on the reimbursement policies specific to each drug plan [for additional plan details, see the Reference Documents section available on the NPDUIS Analytical Studies page of the PMPRB website]. Thus, the comparison of the relative size of these two components across plans is limited. Values may not add to totals due to rounding. *Total results for the drug plans reported in this figure. Between 2014/15 and 2015/16, the total prescription drug expenditure for Canada’s public drug plans soared by $1 billion. This 9.9% growth was unprecedented compared to recent years when rates ranged from 0.2% to 3.7% (see Figure 2.2). This bar graph shows the trend in annual rates of change in prescription drug expenditures from 2011/12 to 2015/16 for the NPDUIS public drug plans. The bars are totals for all NPDUIS drug plans combined. Boxes below each bar show the annual prescription drug cost in billions of dollars. Note: Prescription drug expenditures levels for 2011/12 and 2012/13 do not correspond to those reported in the 1st edition of the CompassRx as data for British Columbia and Newfoundland and Labrador was not available at that time. *British Columbia, Alberta, Saskatchewan, Manitoba, Ontario, New Brunswick, Nova Scotia, Prince Edward Island, Newfoundland and Labrador, and the Non-Insured Health Benefits Program. The annual growth in prescription expenditures is a function of increases in the number of active beneficiaries and their treatment costs. While the overall beneficiary population of the NPDUIS public drug plans grew by 2.0% in 2015/16, a rate comparable to previous years, the average prescription costs for both senior and non-senior beneficiaries increased considerably. In 2015/16, over 9 million active beneficiaries filled approximately 285 million prescriptions that were accepted towards a deductible or paid for (in full or in part) by the NPDUIS public drug plans. Non-seniors make up the majority (60%) of the overall active beneficiary population, although there are important jurisdictional differences in the senior versus non-senior split due to variations in plan design and eligibility (see Figure 2.3). This bar graph describes the shares of senior and non-senior active beneficiaries for the NPDUIS public drug plans in 2015/16. A table below provides totals for the number of active beneficiaries, changes in active beneficiary population from 2014/15 to 2015/16, active beneficiaries as a share of the population and total number of prescriptions. Note: Alberta, Nova Scotia and Prince Edward Island do not submit data to NPDUIS for all their sub-plans, so their non-senior shares may be under-represented. Data source: National Prescription Drug Utilization Information System Database, Canadian Institute for Health Information; Statistics Canada, CANSIM Table 051-0001; Non-Insured Health Benefits Program Annual Report, 2014/15. While the slight increase of 2.0% in the beneficiary population in 2015/16 contributed to the overall 9.9% growth in prescription drug expenditures, the increase in the treatment cost at the beneficiary level played a much greater role. Figure 2.4 reports on trends in the average annual prescription cost per active beneficiary for (a) non-seniors and (b) seniors from 2011/12 to 2015/16. The results are expressed as an index, with the average annual cost in each plan and for each patient group set to the base value of one for 2011/12. The average annual prescription cost per non-senior continued its rise in 2015/16, with a more pronounced increase than in previous years. The results for seniors, however, suggest a shifting trend, with the average annual prescription cost per beneficiary rebounding in several plans in 2015/16 after years of decline. This trend parallels the implementation of generic pricing policies coupled with the launch of generic versions of some major drugs that recently lost patent protection. The 2015/16 increase in the annual prescription cost per senior was due to the increased costs in therapeutic areas such as ophthalmologics, diabetes drugs, immunosuppressants, antithrombotic agents and antivirals. Note: In 2015, PEI introduced a new Generic Drug Program for residents under the age of 65 without private insurance, limiting the out-of-pocket costs for eligible generic prescription drugs. This resulted in a sharp decline in the annual prescription cost per beneficiary in 2015/16. A closer analysis of the annual prescription cost per senior beneficiary highlights variations across plans, both in terms of the level reimbursed as well as the top therapeutic areas (Figure 2.5). While the results are reported as an average per beneficiary, they reflect the therapeutic use of the entire senior population. The highest annual prescription costs for this population were in the NIHB ($2,342) and the Ontario ($2,163) public plans, with relatively high expenditures for diabetes and ophthalmological drugs, respectively. 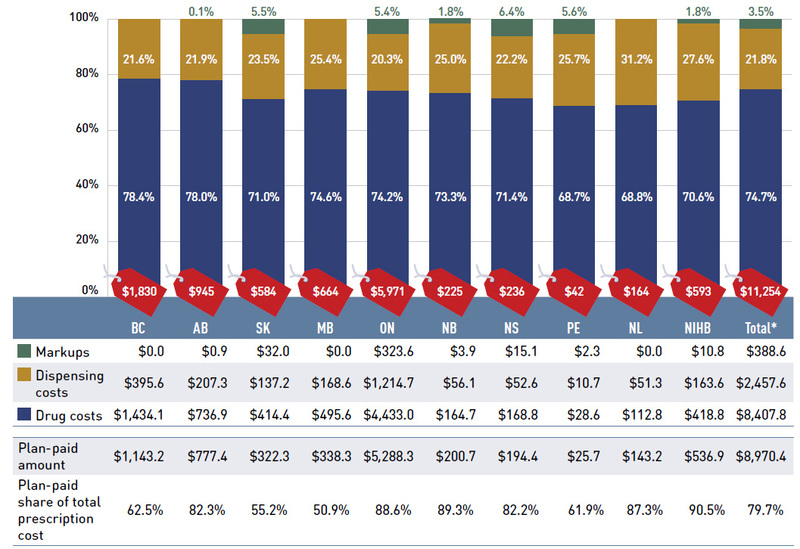 Public plans in British Columbia and Prince Edward Island had the lowest costs per beneficiary ($908 and $1,015, respectively). The average annual prescription cost per senior beneficiary across plans was $1,687 in 2015/16, with an average of $150 and $138 spent on ophthalmologic and diabetes drugs, respectively. This bar graph shows the average annual prescription cost per senior beneficiary in 2015/16 for NPDUIS public drug plans, broken out by averages spent on top ATC 2 level therapeutic classes such as opthalmologic and diabetes. On top of each bar is displayed the average prescription drug cost across all ATCs for each NPDUIS drug plan, while a table to the right breaks out average annual drug cost by ATC 2 level as a total for all NPDUIS drug plans. Note: The comparability of results across plans is limited, as specific medications in some jurisdictions are accessed through specialized programs whose data not included in the NPDUIS database. Results are age-standardized across plans for the senior age groups. *Anatomical Therapeutic Chemical (ATC) classification system maintained by the World Health Organization Collaborating Centre for Drug Statistics Methodology. †Average results for the drug plans reported in this figure. Given the variability in non-senior coverage across public plans, the average annual prescription cost for this beneficiary population provides limited insight into interjurisdictional comparisons. Drug costs form the largest component of prescription drug expenditures and have the greatest influence on their trends. The growth in this component underwent a sharp increase of 12.0% in 2015/16, following virtually no change in 2011/12 (0.2%), a negative rate of change in 2012/13 (-1.6%) and two subsequent years of steady, moderate growth (2.0% and 2.5%). Figure 2.6 examines the annual rates of change in drug costs for each NPDUIS drug plan from 2011/12 to 2015/16. While the rates of change in 2015/16 varied by drug plan (4.5% to 16.9%), all plans displayed a strong positive rate of growth, which was the highest in the last five years for many jurisdictions. This bar graph shows the trend in annual rates of change in drug costs from 2011/12 to 2015/16 for the NPDUIS public drug plans. Figure 2.7 breaks down the annual rate of change in drug costs in 2015/16 by market segment (bar chart) and corresponding market share (pie chart). Patented drugs represented the largest market segment at 58.8% of drug costs. With a considerable growth of 18.8% in 2015/16, they made the greatest contribution to the overall 12.0% cost increase. In particular, high-cost patented drugs—with an average annual cost per beneficiary greater than $10,000—were the fastest growing sub-segment at a rate of 60.5%. More than half of this growth (35.4%) was attributable to the new direct-acting antiviral (DAA) drugs used to treat hepatitis C.
Single-source non-patented drugs also had a remarkable growth rate of 39.8%, but their impact on the overall growth of drug costs was minimal given their small market share (2.5% of drug costs). Multi-source generic drugs, which accounted for one quarter of drug costs, had a more modest rate of increase of 2.4% in 2015/16, dampening the overall drug cost growth. A sideways bar chart on the left breaks down the annual rate of change in drug costs in 2015/16 by market segment. A pie chart on the right displays the market shares as a percent of total drug cost for each segment. Both are totals for NPDUIS public drug plans combined. 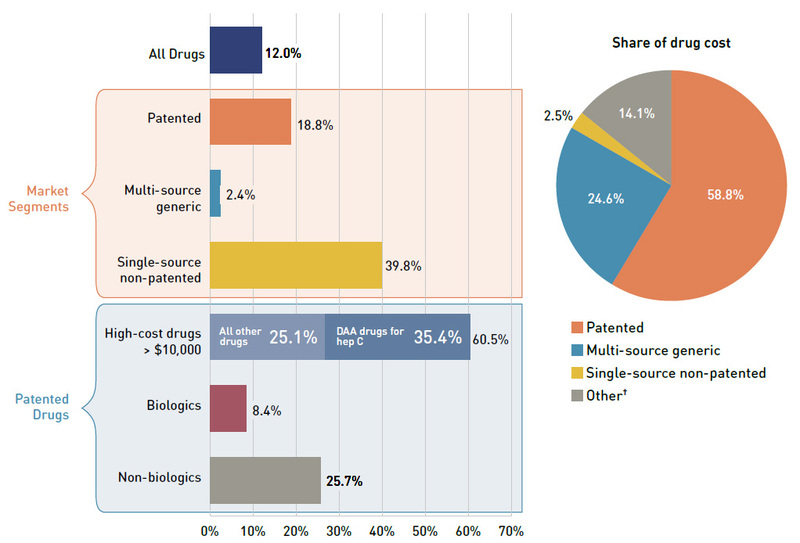 The bar chart is divided into two parts: the top part displays the growth rates for the main market segments - patented, multi-source generic and single-source non-patented - while the bottom half breaks out patented drugs further into high cost drugs over $10,000, biologics and non-biologics. Hepatitis C drugs are highlighted in the high cost drug bar because of their high impact: 35.4% of the 60.5% growth rate. Note: High-cost drugs have an average annual treatment cost of greater than $10,000, and include both biologics and non-biologics. †This market segment includes devices, compounded drugs, and other products that are reimbursed by public drug plans but do not have a Health Canada assigned Drug Identification Number (DIN). Dispensing costs represent the second largest component of prescription drug expenditures. Overall, their rate of growth has been declining in recent years, dropping to 3.8% in 2015/16. Figure 2.8 reports the annual rates of change in dispensing costs for each NPDUIS drug plan from 2011/12 to 2015/16. 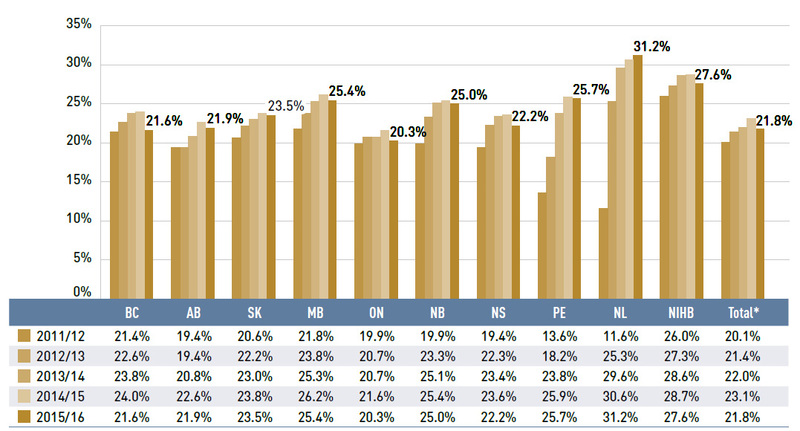 Prince Edward Island, Newfoundland and Labrador and the NIHB had relatively high rates of growth in 2015/16 (9.6%, 7.8% and 7.4%, respectively); in some cases this may have been due to changes in the plan design or the reimbursed dispensing fees. Dispensing costs for the rest of the public plans increased between 1.9% and 5.9%. This bar graph shows the trend in annual rates of change in dispensing costs from 2011/12 to 2015/16 for the NPDUIS public drug plans. 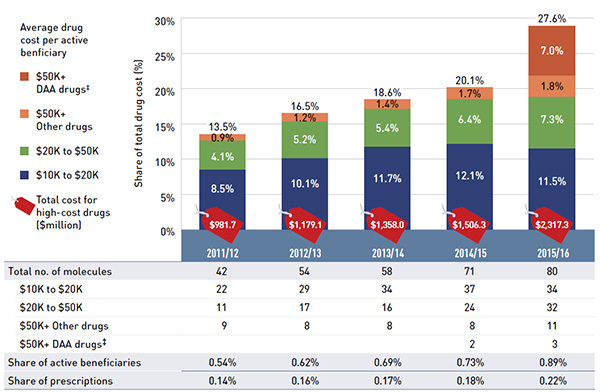 Figure 2.9 breaks down the annual rate of change in dispensing costs in 2015/16 by market segment (bar chart) and corresponding market share (pie chart). Multi-source generic drugs represented the largest market segment (69.3% of dispensing costs). With a sizable growth of 8.1% in 2015/16, they made the greatest contribution to the overall increase of 3.8% in dispensing costs. Part of this growth was driven by generic substitution, as utilization shifted away from the patent sector, which had a declining rate of change in dispensing costs of -5.1%. The single-source non-patented segment had a strong growth rate (11.3%), but its impact on the overall growth in dispensing costs was minimal given its small market share (1.1% of dispensing costs). Dispensing costs for high-cost drugs grew markedly by 20.4% due to an increase in their use. 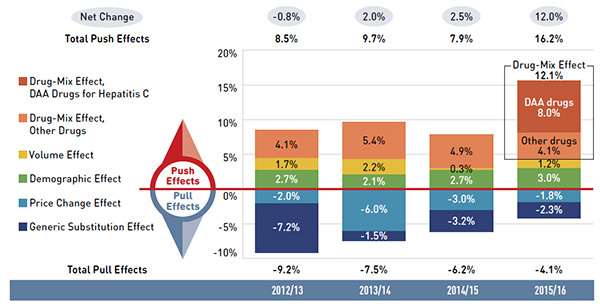 A bar chart on the left breaks out the annual rate of change in dispensing costs in 2015/16 by market segment. A pie chart on the right displays the market shares as a percent of total dispensing cost for each segment. Both are totals for NPDUIS public drug plans combined. The bar chart is divided into two parts: the top part displays the growth rates for the main market segments - patented, multi-source generic and single-source non-patented - while the bottom half breaks out patented drugs further into high cost drugs over $10,000, biologics and non-biologics. In recent years, the dispensing cost share of prescription drug expenditures has been increasing in all public drug plans, as dispensing costs have been rising at a faster rate than drug costs. In 2015/16, however, there was a shift in this trend, with the remarkable rise in the drug cost component crowding out the dispensing cost share (21.8%). Figure 2.10 depicts the trend in the dispensing cost share of total prescription expenditures for each NPDUIS drug plan from 2011/12 to 2015/16. This bar graph shows the trend in annual dispensing costs as a share of prescription costs from 2011/12 to 2015/16 for the NPDUIS public drug plans. * Total results for the drug plans reported in this figure. In 2015/16, drug costs in the NPDUIS public plans rose sharply by $897.6 million, reaching $8.4 billion. This significant 12.0% increase was mainly driven by the emergence of new and curative hepatitis C treatments and the increased use of other high-cost drugs, which collectively pushed the drug cost upward by 12.1%. Growth in the number of active beneficiaries and their use of drugs exerted an additional push of 4.2% on drug costs. Together these upward pressures mounted to 16.2% and were only partially offset by the -4.1% reduction in costs due to generic substitution and price reductions. This counterbalancing downward pull was less pronounced in 2015/16 than in previous years, as the influence of the patent cliff and generic price reductions diminished. Changes in drug costs are driven by a number of opposing “push” and “pull” effects. An increase in the beneficiary population, the use of drugs, and the use of more expensive drugs puts an upward pressure on costs, resulting in a push effect; while generic substitutions and price reductions exert a downward pull effect. The net effect of these opposing forces yields the overall rate of change. Price change effect: Changes in the prices of both brand-name and generic drugs, determined at molecule, strength and form level. Generic substitution effect: Shifts from brand-name to generic drugs. Demographic effect: Changes in the number of active beneficiaries, as well as shifts in the distribution of age or gender. Volume effect: Changes in the number of prescriptions dispensed to patients, the average number of units of a drug dispensed per prescription and/or shifts in the use of various strengths or forms of an ingredient. Drug-mix effect: Shifts in use between lower- and higher-cost drugs, including those entering, exiting or remaining in the market during the time period analyzed. How much would public plan drug costs have changed between 2014/15 and 2015/16 if only one factor (e.g., the price of drugs) changed while all the others remained the same? While each of these factors are determined assuming the others stay the same, in reality, multiple factors change simultaneously, creating a residual or cross effect. The cross effect is not reported in this analysis, but is accounted for in the total cost change. The notable 12.0% increase in drug costs in 2015/16 followed a number of years of negative or low growth. The trend analysis depicted in Figure 3.1 provides insight into the yearly change in cost pressures that drove these varying rates of growth. Some cost drivers, such as the demographic and volume effects, are fairly predictable, contributing cumulatively by approximately 4% to the cost growth each year. However, the pressures from other factors tend to fluctuate from year to year, sometimes counterbalancing one another and making it challenging to anticipate future cost levels. The drug-mix, which has the most pronounced push effect on costs, was relatively stable between 2012/13 and 2014/15, ranging from 4% to 5%. In 2015/16 this effect rose sharply to 12.1%, as the market entry of the direct-acting antiviral (DAA) drugs for hepatitis C put a substantial 8.0% upward pressure on costs, adding to the anticipated impact of other higher-cost drugs (4.1%). These upward cost pressures are generally counterbalanced by the effects of generic substitutions and price reductions, which exert a downward pull on costs. The magnitude of these effects varies by year depending on the timing of generic market entries (patent expirations) and the implementation of provincial pricing policies. While generic substitutions and price reductions have resulted in major cost reductions in recent years, their cumulative pull-down effect on drug costs diminished to -4.1% in 2015/16. In the absence of these cost-saving effects, drug costs in NPDUIS public plans would have increased by 16.2% in 2015/16. 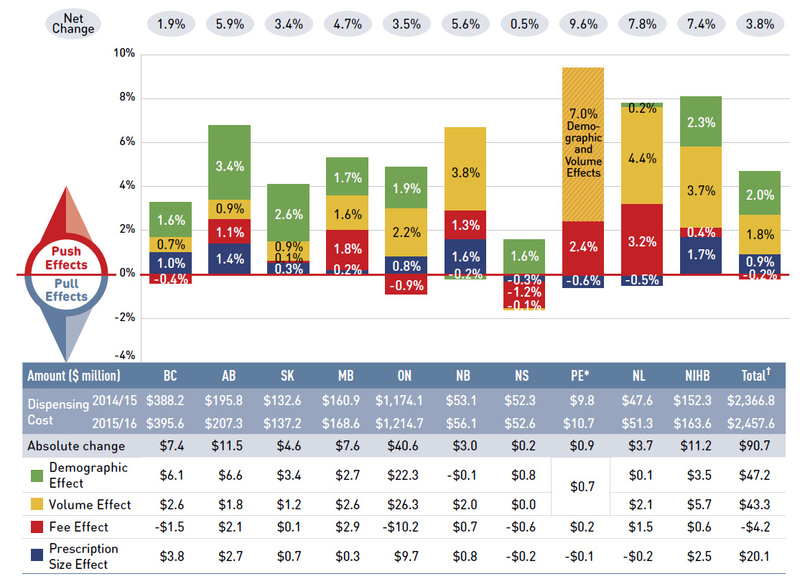 This bar graph and adjacent tables describe the factors or effects that impacted the rates of change in drug costs in the NPDUIS public drug plans for each year from 2012/13 to 2015/16. Each bar is broken out into the following factors - demographic, volume, drug mix, price change and generic substitution - and a percent change is assigned to each. The bars are totals for all NPDUIS drug plans combined, and the effects for Hepatitis C drugs are isolated because of their high impact. Three one-line tables above and below the bar graph show the total positive or push effects and net change, (above) and negative or pull effects, (below) for each year. Note: Values may not add to totals due to rounding and the cross effect. 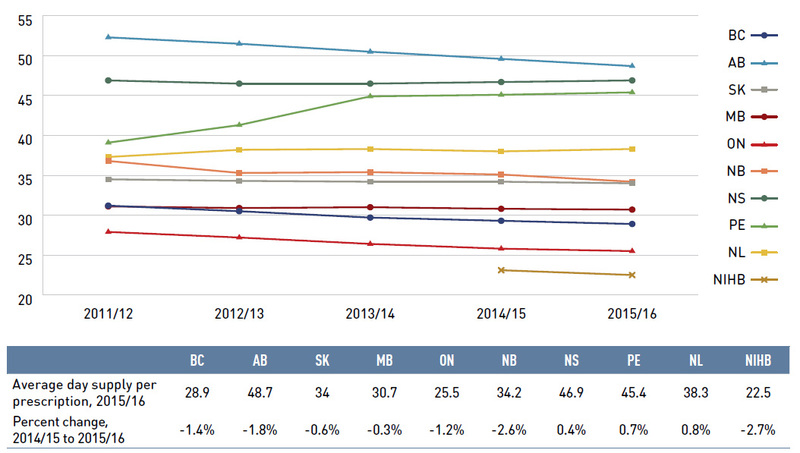 Results for 2012/13 do not capture the data for the British Columbia and Newfoundland and Labrador provincial public drug plans. These overall trends reflect the combined cost pressures observed in the individual NPDUIS public drug plans. Figure 3.2 reports on the cost drivers in each of these plans in 2015/16 as a percent and absolute rate of change in drug costs. The rates of growth in drug costs varied widely across plans, from a low of 4.5% in Newfoundland and Labrador to a high of 16.9% in British Columbia. The variations, however, were mainly driven by the differences in the magnitude of the drug-mix impact. 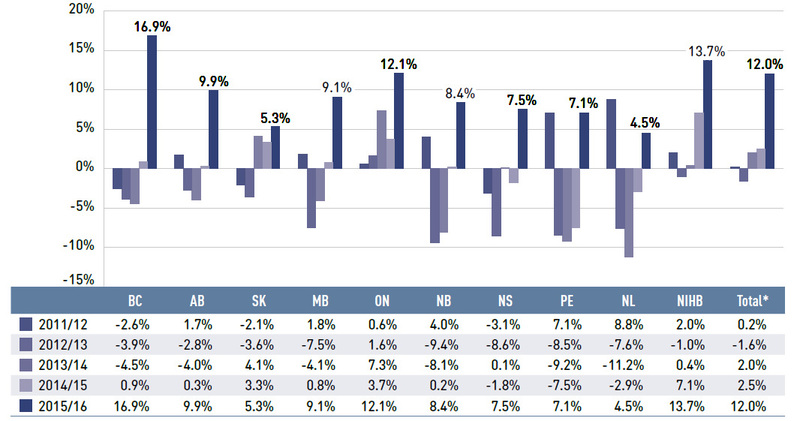 Jurisdictions with higher overall growth rates—British Columbia (16.9%), Ontario (12.1%) and the NIHB (13.7%)—had some of the highest drug-mix effects (18.9%, 11.5% and 11.4%, respectively). The new hepatitis C drugs had a particularly pronounced impact on drug costs in British Columbia (16.0%). The accompanying table gives the corresponding changes in millions of dollars. *The demographic and volume effects were combined for Prince Edward Island. In 2015, PEI introduced a Generic Drug Program for residents under the age of 65 without private insurance, limiting the out-of-pocket costs for eligible generic prescription drugs. This resulted in a large, one-time increase in the beneficiary population and the volume of drugs used. †Total results for the drug plans reported in this figure. The overall 12.0% increase in drug costs in NPDUIS public drug plans represents an absolute growth of $897.6 million, of which $906.6 million are directly attributable to the drug-mix effect: the new DAA drugs for hepatitis C ($600.6 million) and the increased use of other higher-cost drugs ($309.0 million). While the new hepatitis C drugs had the most pronounced overall impact, at an individual plan level, other higher-cost drugs had a greater effect in Manitoba and Saskatchewan. Differences in the drug-mix effect across public drug plans may be related to plan designs, formulary listing decisions, and the disease profiles of the population, among other things. The demographic effect boosted drug costs in the NPDUIS public plans by 3.0% ($222.6 million) in 2015/16. An increase in the number of Canadians eligible for senior coverage (+65) and the launch of new sub-plans (e.g., increased eligibility in PEI) are among the factors that explain this growth. The volume effect, which has been somewhat stable over the past few years, pushed the drug costs up by 1.2% ($87.2 million) in 2015/16. This effect was an important driver in New Brunswick (4.1%), Newfoundland and Labrador (4.8%), and the NIHB (3.0%). The cost-saving effects of generic substitutions (-2.3% or -$169.2 million) and price reductions (-1.8% or -$135.5 million) were almost equal in magnitude in 2015/16 and were relatively uniform across the jurisdictions. Together they represented a considerable 4.1% savings for the NPDUIS public plans ($304.7 million). The following three sub-sections further explore the price change, generic substitution and drug-mix effects for 2015/16. This effect captures the changes in the prices of both brand-name and generic drugs. In 2015/16, reductions in drug prices pulled the overall cost levels downward by 1.8%, translating into savings of $135.5 million for the NPDUIS public plans. An analysis by market segment suggests that the downward pull of the price change effect was mainly due to the reductions in the average unit costs reimbursed in the multi-source generic category, as the average unit costs of patented drugs remained relatively stable, while those of single-source non-patented drugs increased (see Figure 3.3). The reduction in the average unit costs reimbursed for generic drugs in 2015/16 was the result of two main policy initiatives (see Section 1): (i) the pCPA lowered the prices of four additional commonly used drugs to 18% of their brand-name equivalentsFootnote VII; and (ii) Saskatchewan lowered the prices of generic drugs from 35% to 25% of the name-brand price. An overview of generic pricing policies is available in the Reference Documents section of the NPDUIS Analytical Studies page on the PMPRB website. Figure 3.3 reports trends in the average unit drug costs from 2009/10 to 2015/16 by market segment for (a) patented drugs, (b) multi-source generic drugs, and (c) single-source non-patented drugs, along with their corresponding 2015/16 market shares. The results of the average unit costs are presented as an index, with the values for the base year (2009/10) set to one and subsequent years reported relative to this amount. Values were calculated using the cost-weighted average of the average reimbursed unit cost changes at the individual drug level. The analysis was restricted to oral solid formulations to ensure unit reporting consistency. Over the five-year period, the prices of patented drugs, which represent the largest market segment (58.8%), have been relatively stable, while the prices of single-source non-patented drugs, the smallest market segment (2.5%), have been on the rise. Although the prices of single-source non-patented drugs have increased on average by 18%, the impact of this market segment was limited due to its small size. The multi-source generic market segment shows similar trends across all NPDUIS public drug plans (Figure 3.3b): a rapid decline in the first few years, as a result of generic price reforms, followed by a slower decline in 2014/15 and 2015/16, as generic prices stabilized. The variation among the individual plans depends on the timing of generic reforms, the magnitude of generic price reductions, and the utilization rates of generic drugs. Note: The average unit cost was used to calculate the index. The analysis was limited to oral solid formulations. This effect captures the impact of shifts in use from brand-name to equivalent generic products. In 2015/16, generic substitution pulled overall drug cost levels downward by 2.3%, translating into a savings of $169.2 million in drug costs for the NPDUIS public plans. The following three molecules were responsible for most of the savings: escitalopram (-0.6%), ezetimibe (-0.5%) and celecoxib (-0.3%). Figure 3.4 reports the recent five-year trends in market shares by market segment: patented, multi-source generic, and single-source non-patented drugs. The results demonstrate that while the share of prescriptions for multi-source generic drugs markedly increased from 59.9% in 2011/12 to 69.5% in 2015/16, their share of total drug costs significantly decreased over the same time period, from 30.2% to 24.6%. This reflects the results of the provincial generic pricing policies. During the same period, patented drugs, which accounted for a decreasing share of prescriptions (from 16.6% to 11.6%), increasingly dominated public drug plan costs (rising from 50.9% to 58.8%). This shift resulted from the increased use of high-cost drugs, such as biologic therapies and the new DAA drugs for hepatitis C.
This figure shows two complementary bar graphs. The top graph shows the generic share of prescriptions by market segment from 2011/12 to 2015/16 for the NPDUIS public drug plans. 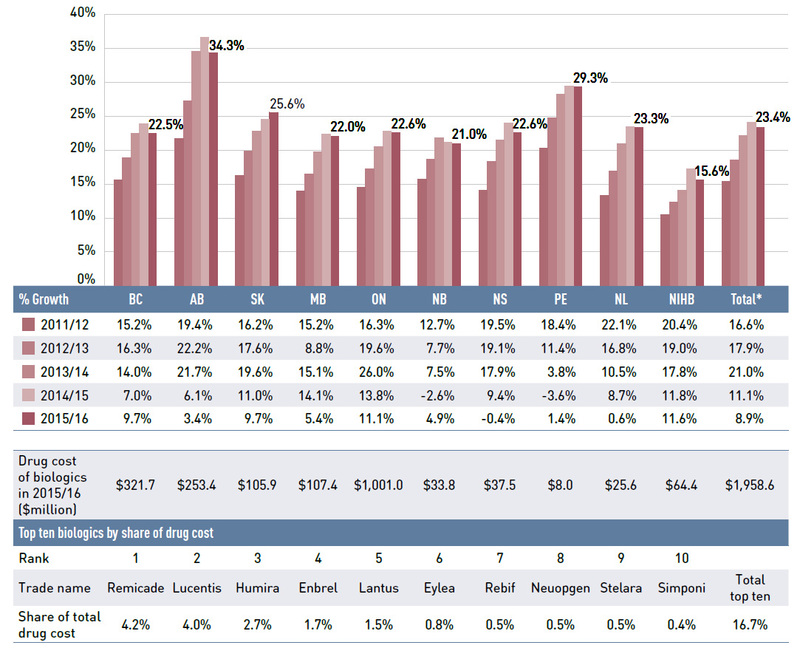 The bottom graph shows the generic share of drug costs by market segment for the same period and plans. *British Columbia, Alberta, Saskatchewan, Manitoba, Ontario, New Brunswick, Nova Scotia, Prince Edward Island, Newfoundland and Labrador and the Non-Insured Health Benefits Program. This effect captures the shifts in use between lower- and higher-cost drugs, including those entering, exiting or remaining in the market during the time period analyzed. In 2015/16, the drug-mix effect pushed overall cost levels up by 12.1%, translating into an increase of $909.6 million for the NPDUIS public drug plans. Figure 3.5 reports the top 10 drugs that made the greatest contribution to the drug-mix effect, accounting for 10.6% of the 12.1% increase. High-cost drugs dominate this list, many having annual treatment costs exceeding $10,000, with thousands of beneficiaries receiving reimbursement through the NPDUIS public drug plans. The emergence of direct-acting antivirals (DAAs), which offer new and curative treatments for chronic hepatitis C, had the greatest impact on the drug-mix effect. The drug cost for DAAs mounted to $600.6 million in 2015/16, and these drugs collectively contributed 8.0% to the growth that year. Three of the DAAsFootnote VIII—Harvoni, Sovaldi and Holkira Pak—were among the six highest contributors to the increase in drug cost levels. Harvoni alone accounted for 6.0% of the 12.1% increase in cost, with Sovaldi a distant second at 1.6%, while Holkira Pak represented 0.27% of the growth. All of these drugs had relatively high average annual costs per beneficiary: $71,402, $79,156 and $48,303, respectively. In the case of Harvoni, the high treatment cost, combined with a relatively large patient population of 6,377, resulted in a $455.3 million push effect on drug costs in the NPDUIS public drug plans in 2015/16. While the new hepatitis C drugs were a major contributor to drug cost growth in 2015/16, other high-cost drugs also played an important role. The recently introduced macular degeneration drug Eylea had an appreciable uptake in 2015/16 and ranked third among the high-impact drugs, contributing 0.9% to the growth in drug costs. At an average annual cost of $4,843, Eylea captured a sizable patient population of 13,550 active beneficiaries in the NPDUIS public plans. The other top contributors had an overall impact on drug costs ranging from 0.18% to 0.51%. Note that Figure 3.5 reports the contribution that the top 10 drugs made to the 2015/16 growth in drug costs. 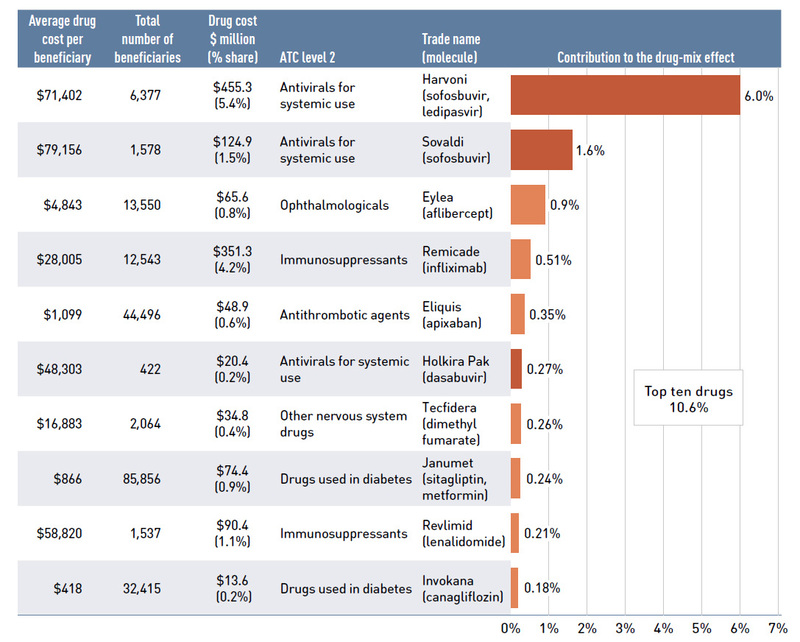 This differs from the share of drug costs reported in the corresponding table. For example, a drug could account for a high share of the costs and have a lower impact on the growth in the overall cost, as measured by the drug-mix effect, if the growth in that product was moderate. This horizontal bar graph shows the top ten drugs contributing to the drug-mix effect in the NPDUIS public drug plans in 2015/16. A table to left of the graph shows, for each drug: the average cost per beneficiary, total number of beneficiaries, drug cost in millions of dollars, percent share of the total drug cost, and the ATC 2 therapeutic class. The NPDUIS public plans are reimbursing a growing number of high-cost drugs that often target relatively small patient populations. In particular, the number of drugs with average annual costs per beneficiary exceeding $10,000 nearly doubled from 42 in 2011/12 to 80 in 2015/16. These drugs, which accounted for 13.5% of the overall NPDUIS drug costs five years ago, accounted for 27.6% of the costs in 2015/16. This sizable share of costs was attributed to a very small percentage of active beneficiaries (0.89%). Figure 3.6 reports on the trends in high-cost drug use from 2011/12 to 2015/16 for the following ranges of average annual drug cost per active beneficiary determined at the drug level: $10,000‒20,000; $20,000–$50,000 and $50,000+. The share of new DAA drugs for hepatitis C is reported separately for 2015/16. The figure also reports the shares of drug costs (bar graph), active beneficiaries and prescriptions, as well as the number of high-cost drugs. All these measures point towards sustained growth in recent years across all cost bands. A bar graph reports the shares of drug costs for high-cost drugs - over $10,000 per beneficiary per year - from 2011/12 to 2015/16, as a total for NPDUIS drug plans. Each bar is broken out by a range drug cost per beneficiary, as follows: $10,000‒ 20,000; $20,000–$50,000 and $50,000+. The share of new DAA drugs for hepatitis C is reported separately for 2015/16. A table below the figure reports on the number of high-cost molecules for each range of cost and hepatitis C drugs separately, along with the total number of high-cost drugs. The last two lines in the table reports on the high-cost drug share of active beneficiaries and prescriptions, as percentages. Note: These results are underestimated, as some high-cost drugs are reimbursed through special public drug plan programs that are not captured in the NPDUIS data. *Average annual drug costs per active beneficiary exceeding $10,000. †British Columbia, Alberta, Saskatchewan, Manitoba, Ontario, New Brunswick, Nova Scotia, Prince Edward Island, Newfoundland and Labrador, and the Non-Insured Health Benefits Program. ‡New direct-acting antiviral (DAA) drugs used in the treatment of hepatitis C; forms part of the $50K+ band. Table 3.1 reports the top 10 high-cost drugs for 2015/16 ranked by their average annual drug cost per active beneficiary. The top eight drugs have treatment costs exceeding $100,000 and relatively small patient populations. 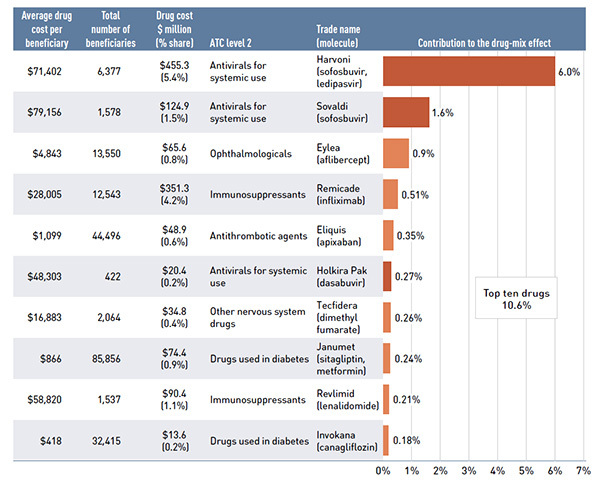 Two of the DAA drugs for hepatitis C—Sovaldi and Harvoni—are among the top 10 most costly drugs. Note: These results are expected to be underestimated and the list of drugs incomplete as some high-cost drugs are reimbursed through special programs which are not captured in the NPDUIS data. †Anatomical Therapeutic Chemical (ATC) classification system maintained by the World Health Organization Collaborating Centre for Drug Statistics Methodology. The table presents the overall results for the NPDUIS public drug plans. There is a significant variation at the individual plan level. While the use of biologic drugs continues to increase, the growth in costs has slowed in the past two years: after peaking at 21.0% growth in 2013/14, biologic drug costs increased by 11.1% in 2014/15 and 8.9% in 2015/16. This strong growth has allowed biologics to capture an increasing share of the total drug costs in NPDUIS public drug plans, reaching 24.1% in 2014/15. In 2015/16, this share declined slightly to 23.4%, as the emerging DAA drugs for hepatitis C began to capture a sizable market share. For the NPDUIS public drug plans, drug costs related to biologics almost doubled to nearly $2.0 billion in 2015/16, up from $1.1 billion just 5 years ago. 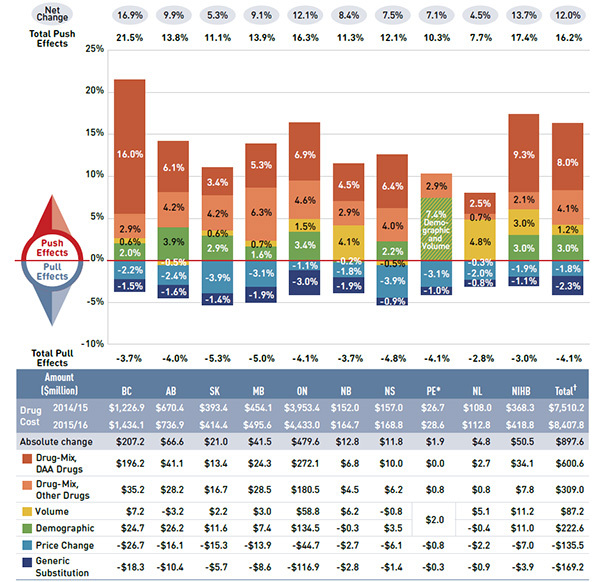 Figure 3.7 reports on trends in the biologic share of total drug costs for the NPDUIS public drug plans, along with the growth in drug costs for this market segment and the current list of top 10 biologic drugs. Alberta and Prince Edward Island had the highest levels of biologic-related costs relative to total drug costs in 2015/16 (34.3% and 29.3%, respectively); while the NIHB and Ontario had the highest rates of growth (11.6% and 11.1%, respectively). Variations across plans may be driven by plan design, eligibility, disease profile of the population, among other things. The top 10 biologics accounted for 16.7% of the total NPDUIS drug costs in 2015/16, with the top four drugs—Remicade, Lucentis, Humira and Enbrel—responsible for 12.6% of the total. This bar graph shows the biologic share of total drug cost for each year from 2011/12 to 2015/16 for the NPDUIS public drug plans. There are three tables below the bar graph. The first shows the percent year-over-year growth in biologic drug cost over five years for each NPDUIS plan, the second displays the total cost of biologics in millions of dollars for 2015/16 while the third shows the top ten biologics by share of drug cost for 2015/16. The latter two tables are totals for all NPDUIS drug plans combined. An analysis by therapeutic class (Figure 3.8) suggests that over two thirds of the total drug costs in 2015/16 were concentrated in five main classes, with antineoplastic and immunomodulating agents representing the highest share (18.0%). The antiinfectives for systemic use class underwent the biggest change, doubling their market share from 6.5% in 2014/15 to 12.1% in 2015/16 and climbing from a 6th to a 4th place ranking. This increase was propelled by the introduction of the DAA drugs for the treatment of hepatitis C.
This bar graph shows the top 10 level one ATC therapeutic classes by share of total drug cost in 2015/16 for the NPDUIS public drug plans. The top five classes are highlighted, illustrating that over two thirds or 69.5% of the total drug costs in 2015/16 were concentrated in these classes. In 2015/16, dispensing costs in the NPDUIS public plans increased by $90.7 million, reaching $2.5 billion. This represented a growth of 3.8%, which was markedly lower than the rates in previous years, mainly due to a decrease in pressure from the cost drivers, especially the fee and prescription size effects. Like drug costs, changes in dispensing costs are driven by a number of opposing “push” and “pull” effects. The net effect of these opposing forces yields the overall rate of change. Demographic effect: Changes in the number of active beneficiaries, as well as shifts in the age or gender distribution. Drug volume effect: Changes in the number of units dispensed to patients. Fee effect: Changes in the average dispensing fee per prescription. Prescription size effect: Changes in the number of units of drugs dispensed per prescription. How much would the dispensing costs have changed if only one factor (e.g., average dispensing fee per prescription) changed while the others remained the same? As with the drug costs analyzed in the previous section, multiple factors change simultaneously, creating a residual or cross effect. The cross effect is not reported separately in this analysis, but is accounted for in the total cost change. The demographic effect, which was generally responsible for the largest annual contribution to dispensing cost growth (up to 3.3% in 2012/13), was only 2.0% in 2015/16. Changes in the average dispensing fee per prescription, which had a sizable push effect on dispensing costs in previous years (ranging from 0.9% to 2.8%), had virtually no impact in 2015/16 (-0.2%), as the average fee per prescription slightly decreased in some plans while increasing in others (Table 4.1). The prescription size effect, which was an important cost driver in previous years (ranging from 1.3% to 1.8%), made only a modest contribution to the growth in dispensing costs in 2015/16, following the introduction of provincial policies related to the number or size of prescriptions. These overall trends in dispensing costs reflect the combined cost pressures observed in the individual NPDUIS public drug plans. Figure 4.2 reports on the drivers of dispensing costs in each of these plans in 2015/16 as a percent and absolute rate of change in dispensing costs. The rates of change in dispensing costs varied widely across plans, from a low of 0.5% in Nova Scotia to a high of 9.6% in Prince Edward Island due to the introduction of a new Generic Drug Program. The latter resulted in a large, one-time increase in the size of the beneficiary population and the volume of drugs used, translating into a large push on dispensing costs from the demographic and volume effects. 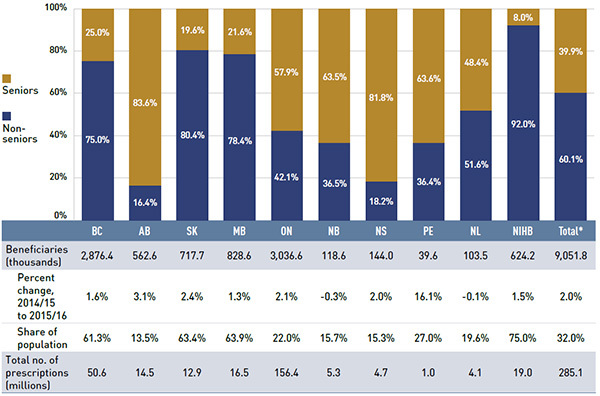 For most of the other jurisdictions, the demographic changes had a more moderate contribution of up to a 3.4%. An increase in the volume of drugs used made the greatest contribution to the growth in dispensing costs in 2015/16 in Newfoundland and Labrador (4.4%), New Brunswick (3.8%) and the NIHB (3.7%). 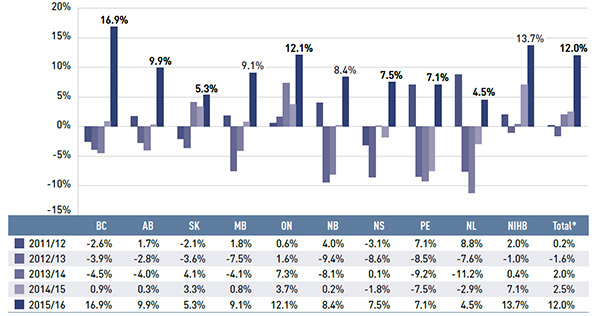 The dispensing fee effect remained fairly stable in most plans, with the highest growth observed in Newfoundland and Labrador (3.2%) and Prince Edward Island (2.4%). This bar graph and tables describe the factors or effects that impacted the rates of change in dispensing cost in each NPDUIS public drug plan from 2014/15 to 2015/16. Each bar is broken out into the following effects - demographic, volume, fee and prescription size - and a percent change is assigned to each. A separate line above the bar graph shows the total positive or push effects as a percent. A table below the graph shows total dispensing costs for each plan - in millions of dollars - for the years 2014/15 and 2015/16, and the absolute change. The lower part of the table shows dollar value totals for each of the effects, also in millions of dollars. Note: Values may not add to totals due to rounding. *The demographic and volume effects were combined for Prince Edward Island. In 2015, PEI introduced a new Generic Drug Program for residents under the age of 65 without insurance, limiting the out-of-pocket costs for eligible generic prescription drugs. This resulted in a large, one-time increase in the beneficiary population and the volume of drugs used. The contribution of the fee effect is directly related to changes in the average dispensing fee per prescription, which in turn is driven by the individual reimbursement policies of each drug plan. An overview of the dispensing fee policies of the NPDUIS public drug plans is available in the Reference Documents section of the NPDUIS Analytical Studies page on the PMPRB website. Table 4.1 reports the average dispensing fee per prescription from 2011/12 to 2015/16, along with the rate of growth between 2014/15 and 2015/16 and the compound annual growth rate for the entire period. The results are an average across all prescriptions and include a range of dispensing fees. A more detailed analysis of the variation in dispensing fees suggests that the dispensing fee level is related to the prescription size: plans with lower average dispensing fees generally reimburse prescriptions with shorter day supplies and vice-versa. For example, British Columbia, Ontario and the NIHB, which had some of the lowest dispensing fees in 2015/16 ($7.82, $7.77 and $8.61, respectively), reimbursed prescriptions with relatively small average sizes (28.9, 25.5 and 22.5 days supplied per prescription, respectively). Figure 4.3 depicts the trend in day supply per prescription from 2011/12 to 2015/16. The results represent the average across all prescriptions for oral solid formulations, and encompass brand-name and generic drugs for both acute and maintenance therapies. The results suggest that prescription sizes were either stable or declined slightly in most public drug plans. New Brunswick and the NIHB had the most pronounced reductions in average prescription size in 2015/16 (-2.6% and -2.7%, respectively). This exerted an upward push on dispensing costs (Figure 4.2), as a greater number of prescriptions were required to dispense a given volume of drugs. This line graph shows the trend in average day supply per prescription from 2011/12 to 2015/16 for each NPDUIS public drug plans. This figure also includes a table with the average day supply per prescription in 2015/16 and the percent change in day supply from 2014/15 to 2015/16. Note: The results pertain to oral solid formulations only. Figure 4.4 provides a more applicable comparison of dispensing costs across plans by using a select group of drugs common to all jurisdictions: the 18 generic drugs subject to pCPA policies that reduced their prices to 18% of the equivalent brand-name products. The dispensing costs for one million tablets of each drug are presented for two years: 2011/12 and 2015/16. These drugs collectively accounted for 16.2% of the total dispensing costs in NPDUIS public drug plans. Generally, the dispensing costs reimbursed by public drug plans increased from 2011/12 to 2015/16, although the size of the increases varied considerably. Saskatchewan, Manitoba, Newfoundland and Labrador, and the NIHB reimbursed some of the highest dispensing costs: close to or above $200,000 for one million tablets. Note that the disease profile of the beneficiary populations and the types of drugs prescribed (acute versus maintenance) influence the average day supply, and hence, the overall dispensing costs for each plan. The bar graph shows the dispensing cost in thousands of dollars for one million tablets of 18 common generic drugs for two years - 2011/12 and 2015/16 - for each NPDUIS public drug plan, and the total. Note: Long-term care homes were excluded from this analysis, as they may not have a typical dispensing frequency due to the more specialized needs of their patients. The following sub-plans were not included in the analysis: BC: Permanent Residents of Licensed Residential Care Facilities; MB: Personal Home Care/Nursing Homes; NB: Individuals in Licensed Residential Facilities, Nursing Home Residents; ON: Long Term Care, Home Care, and Homes for Special Care. *Subject to the pCPA policies that reduced the prices of generic drugs to18% of their equivalent brand-name products: atorvastatin, ramipril, venlafaxine, amlodipine, omeprazole, rabeprazole, rosuvastatin, pantoprazole, citalopram, simvastatin, clopidogrel, gabapentin, metformin, olanzapine, donepezil, ezetimibe, quetiapine and zopiclone. Note: Drug costs of less than $5,000 appear as $0.00 million due to rounding. †Total results for the public drug plans reported in this figure. Note: Drug costs of less than $500 will appear as $0.00 thousand due to rounding. Note: Drug costs less than $5,000 appear as $0.00 million due to rounding. NPDUIS reference documents provide supplementary information on topics such as public drug plan polices and designs, analytical methods, and terminology, to support the analytical content of the PMPRB NPDUIS reports. Links to the Reference Documents section are available on the NPDUIS Analytical Studies page of the PMPRB website. Clopidogrel, gabapentin, metformin and olanzapine. Donepezil HCl, ezetimibe, quetiapine and zopiclone. Atorvastatin, amlodipine, simvastatin, pantoprazole, ramipril and clopidogrel. Drug costs reported in the NPDUIS Database do not reflect PLA prices. Based on clinical trials, DAAs have shown dramatic improvements in efficacy, as well shorter treatment times and significantly fewer side effects than conventional therapies. An estimated 254,987 Canadians (Trubnikov, M. et al, 2014), had chronic hepatitis C in 2011, and given the high-cost of these drugs, coverage is often restricted to patients with a certain level of disease severity. However, a patient’s complete cure may, in the long run, represent savings to the health-care system. Canadian Institute for Health Information. 2016. 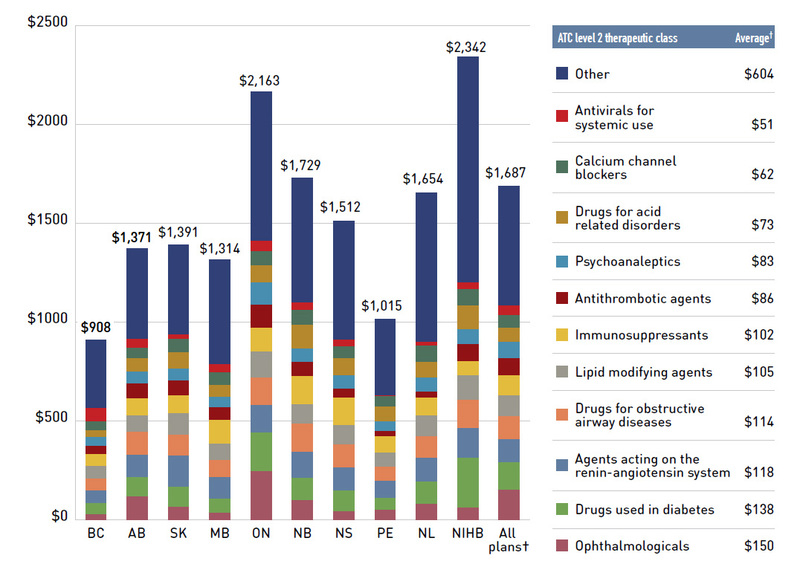 Prescribed Drug Spending in Canada, 2016: A Focus on Public Drug Programs. Ottawa, ON: CIHI. Available at: https://secure.cihi.ca/estore/productFamily.htm?locale=en&pf=PFC3333 (Accessed January 2017). Canadian Institute for Health Information. 2016. National Prescription Drug Utilization Information System Plan Information Document, July 2016. Ottawa: CIHI. Available at: https://secure.cihi.ca/estore/productFamily.htm?pf=PFC3234&lang=en&media=0 (Accessed January 2017). IMS Brogan Strategic Information Services. 2015 and 2016. Provincial Reimbursement Advisor (PRA). Volume 18 (2, 3, 4) and Volume 19 (1, 2). Patented Medicine Prices Review Board. 2013. The Drivers of Prescription Drug Expenditures: A Methodological Report. Ottawa: PMPRB. Available at: http://www.pmprb-cepmb.gc.ca/view.asp?ccid=887&lang=en (Accessed January 2017). Health Canada. 2017. Notice of Compliance (NOC) Database. Available at: http://www.hc-sc.gc.ca/dhp-mps/prodpharma/notices-avis/noc-acc/index-eng.php (Accessed January 2017). Patented Medicine Prices Review Board. 2016. PMPRB Guidelines Modernization: Discussion Paper. Ottawa: PMPRB. Available at: http://www.pmprb-cepmb.gc.ca/en/news-and-events/consultations/current-major-consultations/rethinking-the-guidelines/discussion-paper (Accessed January 2017). Patented Medicine Prices Review Board. 2016. PMPRB Annual Report 2015. Ottawa: PMPRB. Available at: http://www.pmprb-cepmb.gc.ca/en/reporting/annual-reports (Accessed January 2017). Canadian Agency for Drugs and Technologies in Health. 2017. Common Drug Review Database. Available from: http://www.cadth.ca/products/cdr (Accessed January 2017).